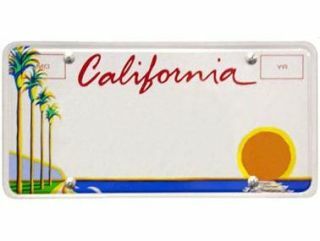 "My other car is a Porsche..."
The California Legislature is looking at the possibility of trialling electronic car license plates in the sunshine state. The electronic plate would look very much like a normal license plate when the car was moving, but would be able to switch to ads or other messaging when the vehicle was stationary for more than four seconds. The car's license plate number would however still be shown at all times in some section of the screen. Democratic Senator Curren Price of Los Angeles is trying to push the bill through in order to make California the first US state to use the new tech. Seeing the move as a potential money-spinner for the state, Price notes: "We're just trying to find creative ways of generating additional revenues. "It's an exciting marriage of technology with need, and an opportunity to keep California in the forefront." Californian company Smart Plate is currently developing a digital electronic license plate, which it hopes to be able to deploy soon. Smart Plate Chief Exec, M. Conrad Jordan, said that: "The idea is not to turn a motorist's vehicle into a mobile billboard, but rather to create a platform for motorists to show their support for existing good working organizations."